There are different types of laptop cases that you can choose from. The simplest of the lot is a sleeve. 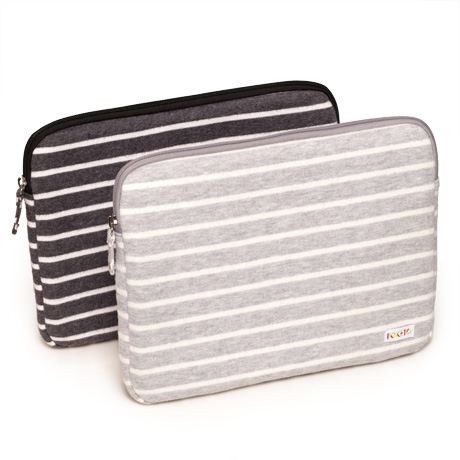 A laptop sleeve is used for storing a laptop and nothing else – no bells & whistles here! People prefer sleeves because they are extremely lightweight and offer adequate protection. The most popular laptop cases are the bags that have straps for the users to carry the bags. These are known as messenger-type bags. But people have complained that they feel shoulder pain by using these bags and thus, the backpacks have also become highly popular now. And for those who need to travel extensively, the rolling laptop bags are most convenient. These cases are like suitcases with wheels and can be rolled along the ground. These cases usually have larger spaces where clothes and accessories can also be kept. For functionality, there are a few elements that you should consider. Leather is definitely the classiest material for laptop cases. Leather simply makes any laptop case stand out. But these days you can also look at other materials including artificial leather. You should consider a material that offers adequate protection and is also waterproof. If you are planning to purchase a laptop case made with soft material, ensure there are protective inner linings. The material used in making the straps (if applicable) is also important – it should be able to withstand adequate load without snapping. This element completely depends on how you intend to use your laptop case. Laptop cases have different amounts of storage space and as you go through the details of any case, you will have full information about this point. Even if a laptop case has more space than required, there is nothing wrong in making the purchase because you never know when you will need that extra space. While this is not an element that many people consider, there are some that do. Laptop case pockets can prove to be extremely helpful at times because you can store many items (usually the small ones) in these. These pockets are handy when you have to carry a bottle of water. You will not need to open the case for fetching the bottle. If you need to carry sensitive documents and some other critical items in your laptop case, you should look for those cases that have locking mechanisms. The locking mechanism should be such that it cannot be opened up easily. As far as the design of laptop cases are concerned, you have enough choices. There are the standard black colored cases that are more preferred by men. For women, there are laptop cases available in different patterns and designs and these can add to their overall look too. Many men also prefer designer laptop cases – especially if someone is fashion conscious. Laptop sleeves typically have excellent designs and they are available in different colours and patterns. And because these don’t cost much, you can keep changing them from time to time. No matter which laptop case you purchase, ensure that it has manufacturer’s warranty. Because most of the laptop cases are made of softer materials, it is important that you don’t need to buy one every other month. If something goes wrong with the case in the initial stage, your laptop case manufacturer should protect you against the damage. Which laptop cases for which use? If you don’t need to travel a lot, laptop sleeves are best suited for you. The models that you may want to look at include Runetz - 13-inch Pink Soft Sleeve Case Cover for MacBook Pro 13.3", Dell Premier Sleeve, EasyAcc 13.3 inch Laptop Ultrabook Envelope Case Sleeve, Built Neoprene Sleeve for 11-inch MacBook Air and Case Logic 13.3" Laptop Sleeve. On the other hand, where you travel a lot, backpacks make for excellent laptop cases. The top models in laptop backpacks are ASUS ROG Nomad BackPack, Targus TSB226CA, Targus Voyager Notebook Backpack, Mobile Edge Razer Carrying Case and Case Logic 16" Laptop Backpack. For more convenience, consider purchasing rolling laptop cases and some of the top models in this category are Cabrelli Fashion Executive Rolling Briefcase, Targus 15.4" Rolling Laptop Case, Swiss Gear 15.6" Rolling Business Traveler and Bugatti Sedona Inc Bond Street Stay-Open Rolling Computer Business Briefcase. Speck Presidio Clear Case for MacBook Pro 13"